I'm squeaking in under the deadline with this one, for sure 😜 The November Island Batik challenge is Cozy Log Cabin and there were two stipulations...the project had to use log cabin blocks in some form and the finished size had to be at least 36" square. Well...I got it half right, lol. 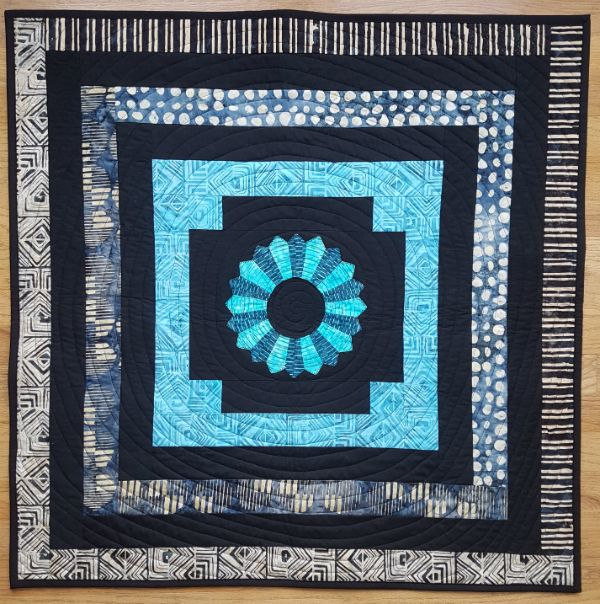 When I first started thinking about this challenge, I figured I'd probably use quarter log cabin blocks, but then I bought the dresden ruler and started looking for a reason to use it. The middle square of one really big log cabin block seemed like a great place to put a dresden plate, so that became the new plan. I drew up the plan in EQ8 with a finished size of 36". This challenge also seemed like the perfect place to use the Spirit Rhythym 2 ½" strips that were in my second Island Batik box. Actually, several of us ambassadors have used our strip packs this month. Log cabin blocks just seem to ask for precut strips, don't you think? 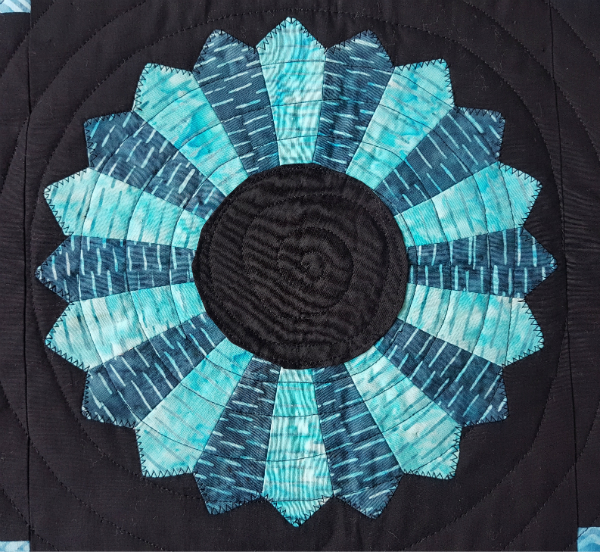 I happily pieced my dresden plate and appliqued it to the 9 ½" square for the center of the quilt and then started building around it. 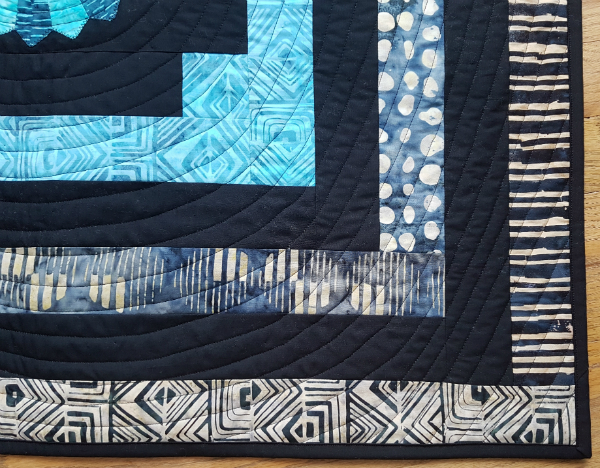 It wasn't until I was adding the last round of strips that I realized that somehow my quilt was only going to be 33", not the 36" I had planned. That was when I actually looked at the measurements in EQ8 and realized I had intended to start with a 12 ½" square. Oops! 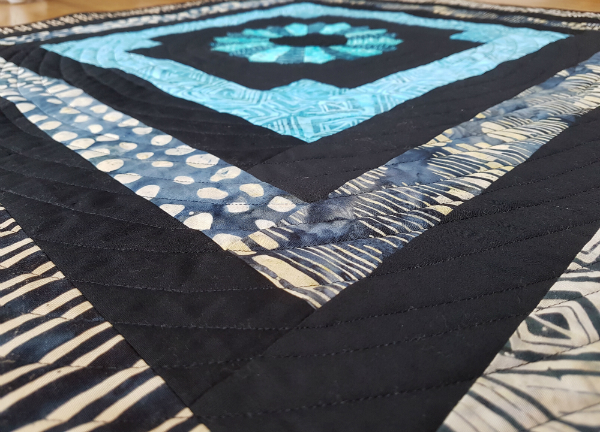 I considered adding more rounds to bring it up to the 36", especially since the Spirit Rhythym line has a lot of beautiful fabrics in it, but I wanted to limit the colours to the teals and blacks and I didn't have enough of any print in those colours for another round. Ah well. 33 is close to 36, right? Then it was time to quilt it, but I couldn't decide how I wanted to do that. I felt like it was asking for some detailed free motion, but I had no inspiration. I basted it with a scrap piece of Warm and Natural batting and then I waited a few days, pondering, but I couldn't figure it out. The only idea I had was for the center of the dresden plate. Every time I thought of quilting that center circle, I pictured a spiral. 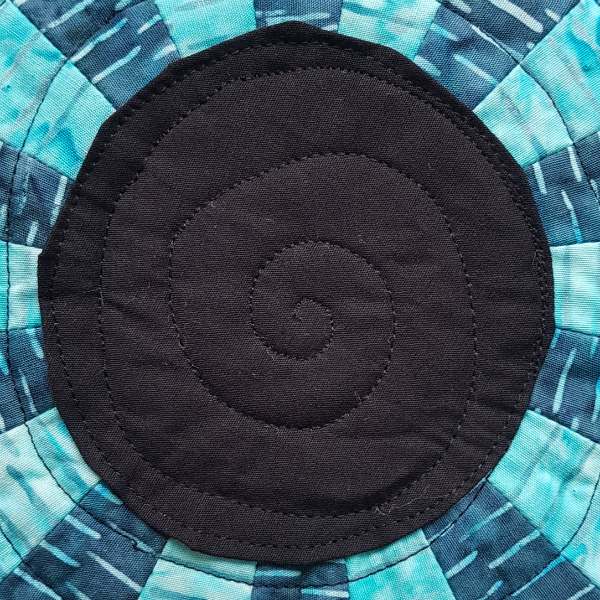 I chose to use my free motion foot for the whole spiral because a) I'm lazy and didn't want to have to turn the quilt as much as a walking foot would require and b) the irregular lines in the Spirit Rhythym prints seemed to lend themselves to more irregular quilting lines as well. 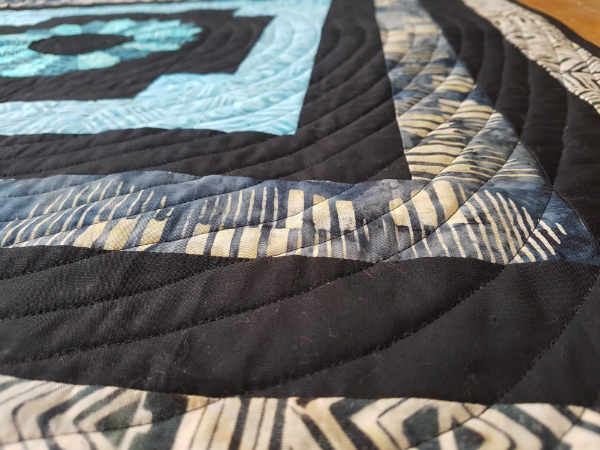 This was my first time quilting one giant spiral over the whole quilt and I have to say I really enjoyed how quickly I finished the whole quilt. Of course, it's only a 33" square, so pretty much any quilting design would have felt like it was finished quickly, lol. 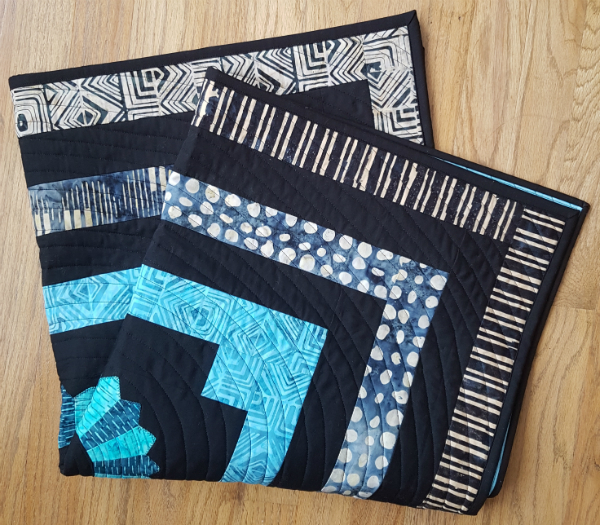 Usually, when I think about quilting, I think about outlining any appliques or highlighting special sections of the piecing. Quilting one big spiral doesn't do either of those things. Let me tell you, when I reached the edges of the dresden plate and completely ignored those points...it felt very weird! 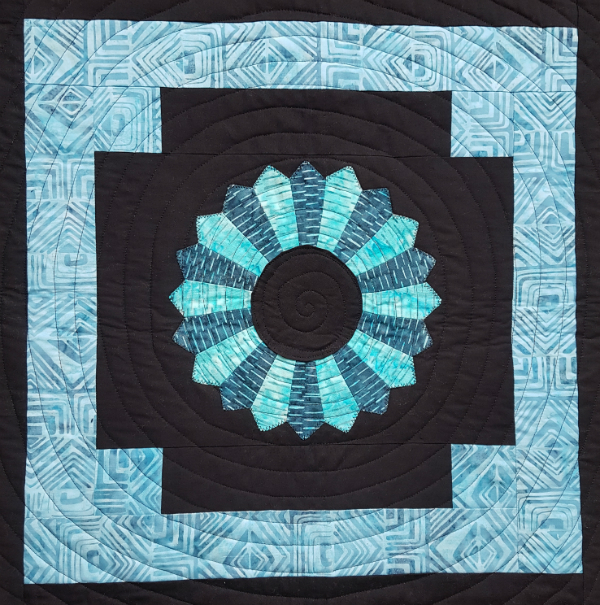 In the end, though, I think the quilted spiral serves to highlight the spinning effect created by the print (which, as you may remember, was a total accident!). 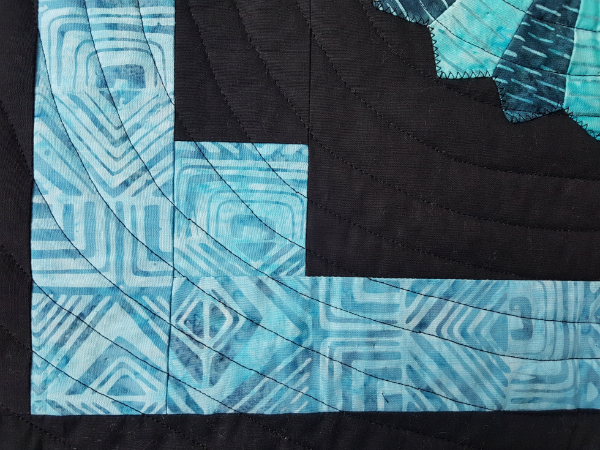 Another thing about quilting one spiral is that it means there's no changing thread colours. 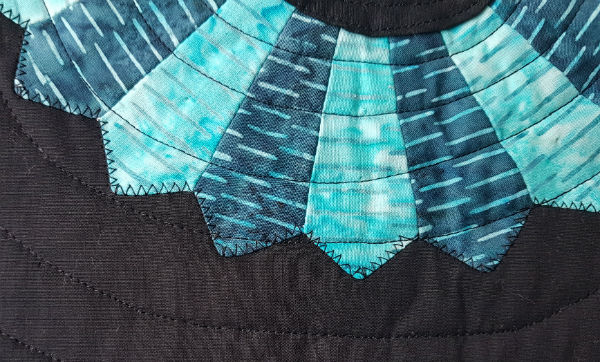 Over the black prints, that wasn't a problem, but I wasn't sure how I'd feel about having black thread over the teal fabrics. Happily, I found that it doesn't bother me at all, especially from a distance. Phew! It's suppertime on the last day of the month, but I managed to get this posted before the calendar flips over to December. Yay! And, as I type, the pieces of my December challenge project are spread out all over our kitchen table. The power was out here from last night around 9:30 until about 3:30 this afternoon, so I did as much of the non-sewing work on that as I could. Both this mini quilt and my December project are destined to be Christmas gifts, so it feels good to be making progress on that list, especially as we'll be into December in just a few hours. Are you making any gifts this year? I hope you have a great weekend, with lots of sewing time! My that creativity has certainly been flowing this year. You had way too much fun with these challenges. Well done. Congratulations on getting it done and posted in November! I'm glad your power came back on. Stay warm and cozy up there and hooray for having such a great jump start on all your holiday handmade gifts! this is a really beautiful quilt Leanne. I think the quilting suits it. There are some really interesting prints in these batiks. I love the direction of the fabric on the dresden. The pattern gives it great movement.